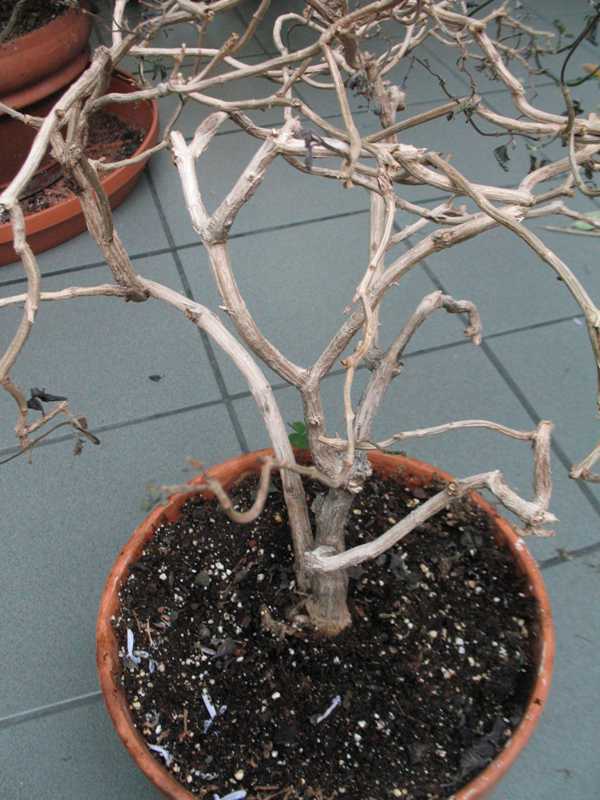 Overwatering is one of the more common causes of plant problem. Heavy and poorly drained soils are susceptible to becoming waterlogged. Roots growing in waterlogged soil may die because they cannot absorb the oxygen needed to function normally. The longer the air is cut off, the greater the root damage. The dying roots decay and cannot supply the plants with nutrients and water. 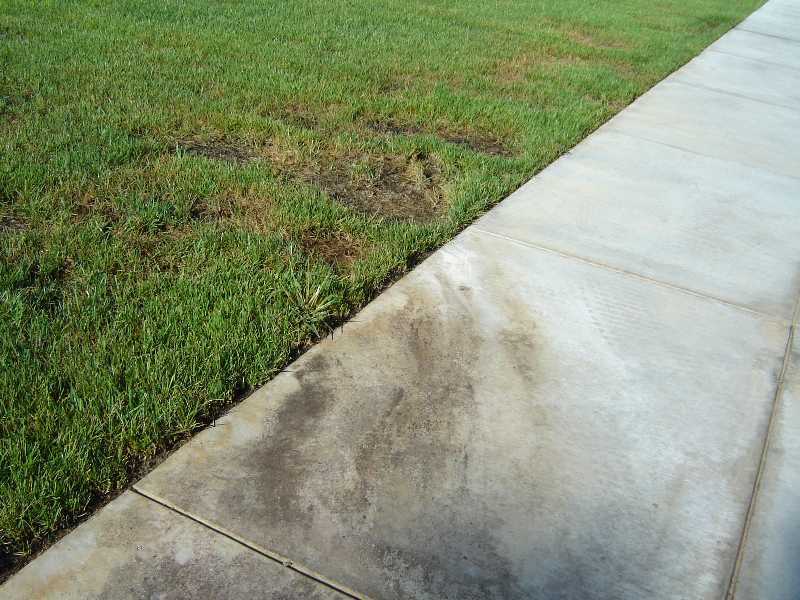 Damage caused by over watering is frequently misdiagnosed as pest damage. However, pest damage rarely causes roots to concentrate near the surface of the soil. Plants stressed or injured by waterlogging can become abnormally susceptible to certain fungal pathogens. Phytophthora spp. for example, cause root rot most often in soils that are periodically waterlogged. Plants growing in soil that is too wet suffer from a lack of oxygen which leads to the death of roots and a loss of vigor in the plant. Stunted slow growth with yellowing leaves is a symptom of over watering. 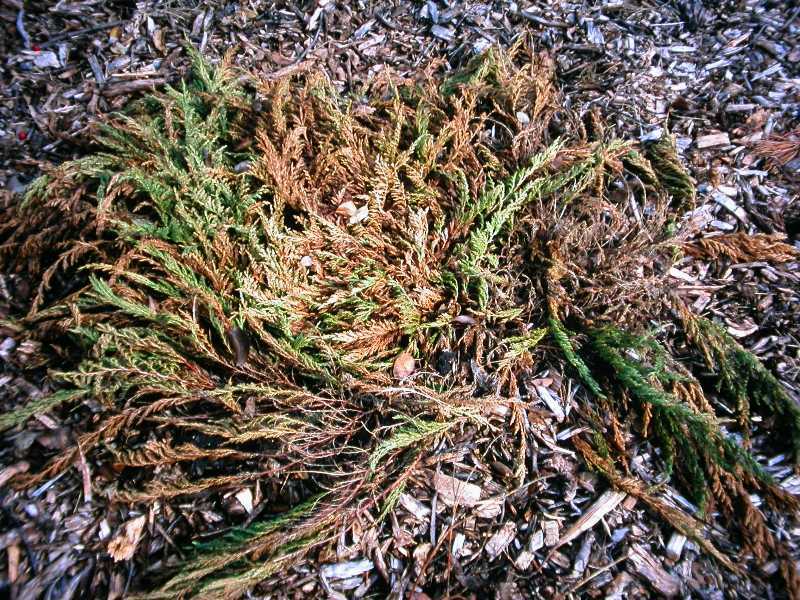 Plants may suffer from leaf scorch or leaf burn. Water soaked spots and blisters (Oedema) may appear on stems and leaves. The crown of the plant may rot. 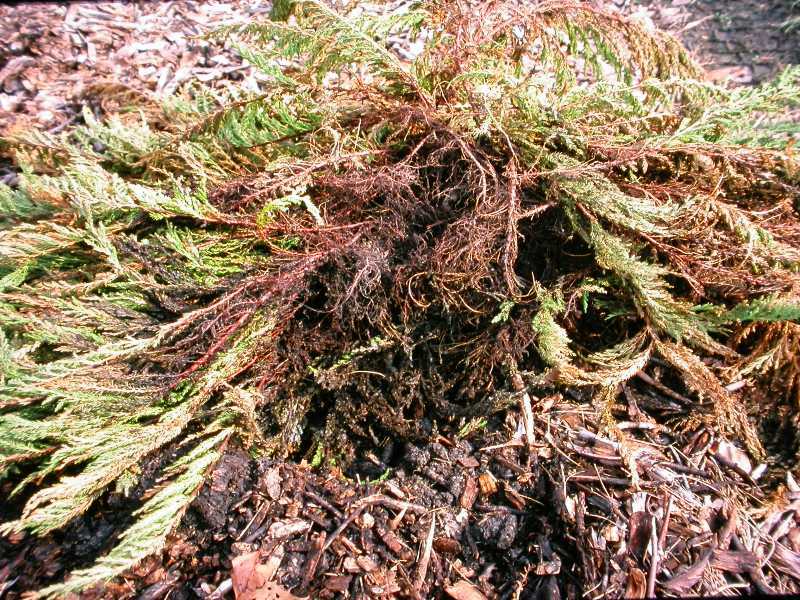 Damaged roots have little defense against the entrance of rot causing soil organisms. And so the plant dies of root rot. 1. Deep watering encourages roots to go deep down in the soil to where it is moist and a lot cooler. Water less frequently but for longer periods, so water reaches deep into soil. Good thorough watering promotes healthier plants. 2. Investigate using water conserving drip emitters or soaker hoses on a timer. Adjust watering frequency and amounts based on season, temperature and amount of rainfall. Overhead watering uses more water and can promote fungal disease. Also make sure you don't have leaking irrigation pipes or downspouts that are keeping the soil too wet in a location. 3. Add mulch to individual plants or beds. Add organic matter such as compost or rotted manure to plantings ---organic matter can improve drainage in heavy clay soils. Take care to keep mulch away from stems. 4. Use appropriate plants. Evaluate your site for new plantings. Choose plants with the appropriate water and cultural needs that will thrive on your site. Use water loving plants for moist poorly drained soils. Also consider native plants, which generally adapt better, have lower water demands and fewer pest problems. 5. Water only when necessary. Most plants will normally wilt in hot sun and may recover on their own later in the day as the sun moves. Make sure soil is not too wet based on the needs of particular plants before watering; you may end up by over watering. 6. A dry surface is not always a sign of water need. The surface generally dries out first and is not a true indicator of what is going on down deep near the plant root. Make use of a hand trowel or soil probe to check for moisture. 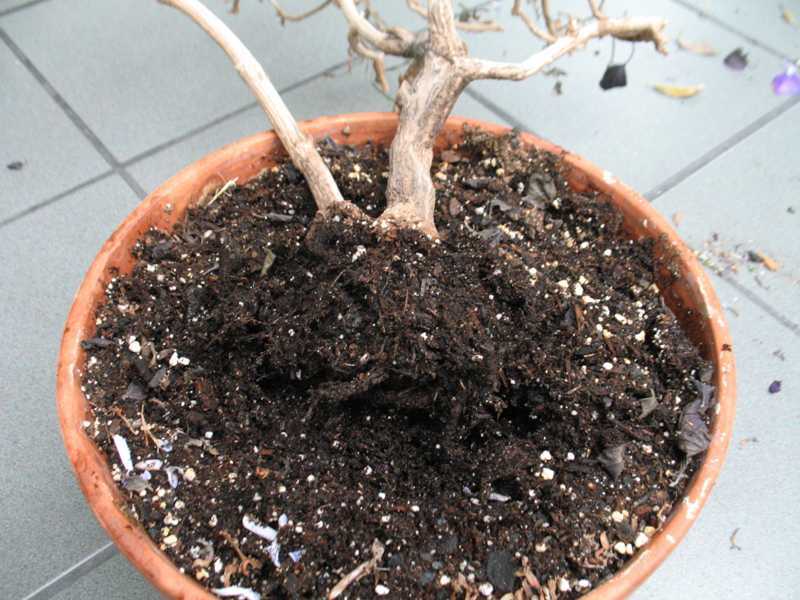 Check for overwatering by digging into root zone or knocking a small potted plant out of its container. Soil that has been too long without oxygen usually smells sour or rotten. 7. Give priority to watering newly planted trees and shrubs. Young plants have not had sufficient time to establish deep root systems, and depend on surface water for survival. Do not let the root balls of newly planted trees and shrubs dry out completely or become too saturated. Before watering use a soil probe or a hand trowel. Remember that when plants are fully established, they will require less water. 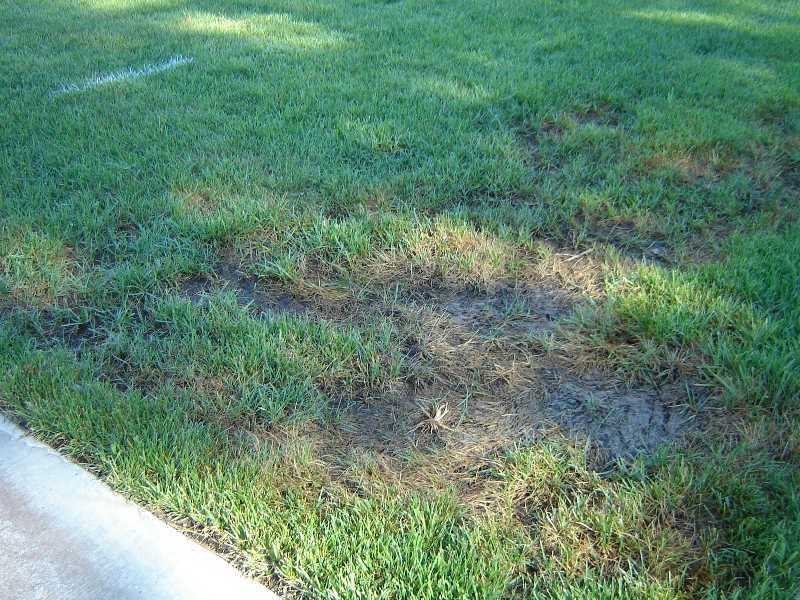 Areas of standing water or soggy soils in lawns equals the death of turfgrasses, such as, fescue (Festuca). 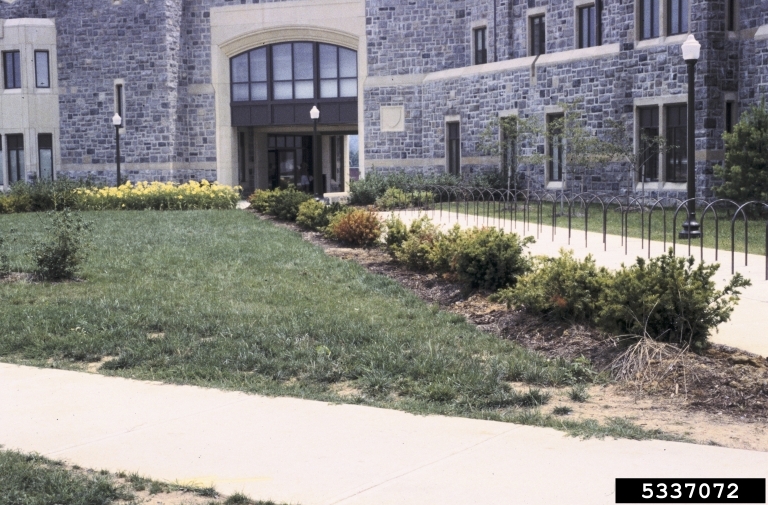 Lawn grasses, such as, fescue (Festuca) in soggy soils will not thrive. Without air space in the soil, grass roots cannot absorb water and nutrients. 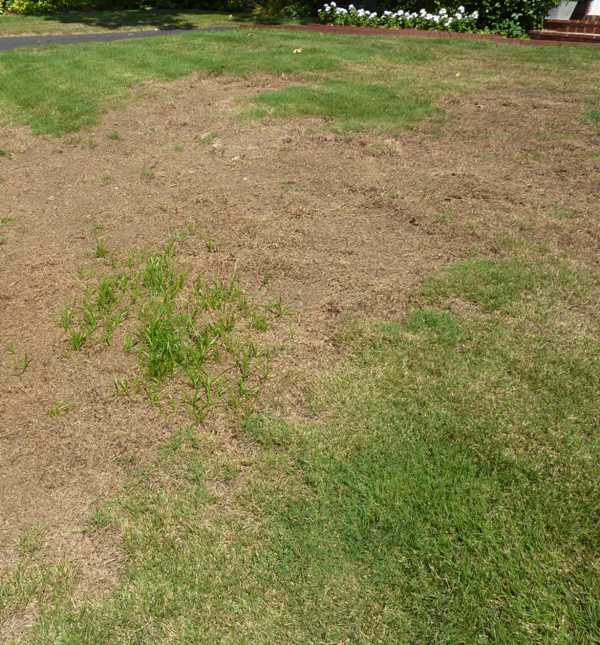 Zoysia grass killed by water collecting in low areas during a wet summer. Note water loving yellow nutsedge sprouting in dead areas to the left.